I don’t know about you but I have a stupid amount of cake tins. Admittedly I do make wedding and birthday cakes for a living but there are some tins I have only ever used once. I have either bought them for a specific cake or it was an impulse buy because it looked nice! I mean, do I really need a beehive shaped tin or a Christmas wreath tin? What can I say in my defence? Nothing! There are some shaped tins that I own, however, that I wouldn’t be without; my giant cupcake tin and a spherical tin are both used regularly. I have a feeling that this Wilton 3D Skull tin will be another. In fact I have already taken an order for a 60th birthday cake in January! I think this cake tin will pay for itself! their example recipe is either in terms of shop bought cake mixes or if is simply inaccurate in terms of how much mixture is actually needed to fill the tins. the cooking times are wrong or you have to cook each section separately because they each have a different cooking time. the cakes stick to the tin which makes turning the cakes out very difficult and often results in the cake shape being damaged. This particular cake tin had pumpkin spice pound cake as its suggested recipe to use. I personally am not over keen on pumpkin and certainly wouldn’t want a pumpkin flavoured cake. On review of their recipe and by converting cups to pounds and ounces I decided that my 6 egg maderia cake recipe should be a suitable alternative. I made sure that the tin was well-greased and given a dusting of flour, preheated the oven and away I went. I split the mixture evenly between the two sections even though the one side does look like it needs more (it is a bit of an optical illusion!) and popped it in the oven at 160 C/ 140 C fan for 1 hour as per the manufacturers instructions. Well, my first surprise was that they cooked perfectly in exactly 1 hour! I left them in the tin for 5-10 mins then decided to turn them out onto a cooking rack. I fully expected to have to do battle with the tin to release the cakes but, surprise number 2, they turned out perfectly with no intervention from me! 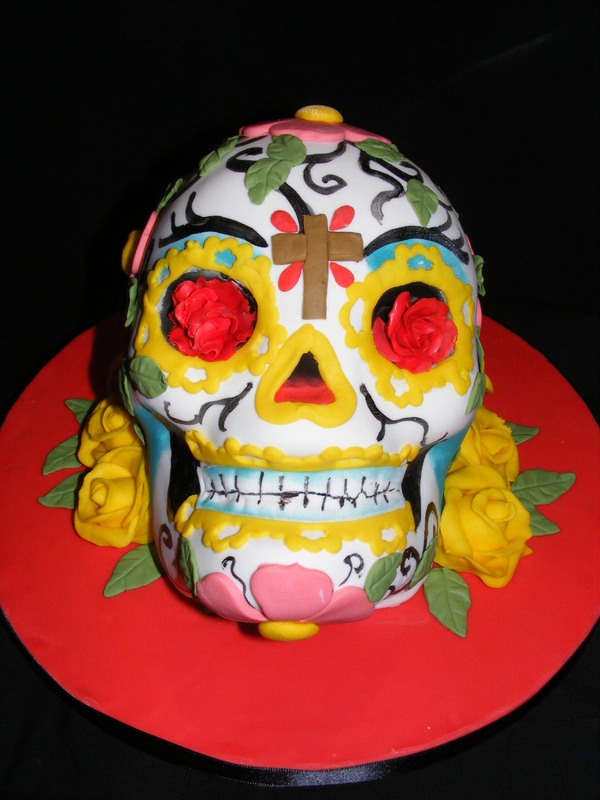 Obviously the intention is for the two sections to come together to create a 3D skull shape but, as with all cakes,the tops are not perfectly flat. Wilton, however, have thought of that! They have designed their tins to have a “cutting” ridge. That means that once the cakes are cooked and completely cooled you can trim them using the cutting ridge as a guideline. The 2 sections will them fit perfectly together. I did find it necessary, however, to push a dowel through the cakes to stop the “face” cake sliding once I sandwiched them together with buttercream. I cannot fault this cake tin! It is absolutely brilliant! I am sure that this tin will be escaping from cake tin purgatory on a regular basis! Well Done, Wilton!